Which Is Better, Coconut Oil or Olive Oil? The Journal of the Academy of Nutrition and Dietetics recommends that healthy adults get 20 to 35 percent of their energy from dietary fats. Both olive oil and coconut oil are good oils for your kitchen, depending on what you're cooking and what health benefit you're looking for. Both products are made by expressing the oil from their respective fruits. A tablespoon offers about 120 calories and 14 grams of fat, according to the United States Department of Agriculture. 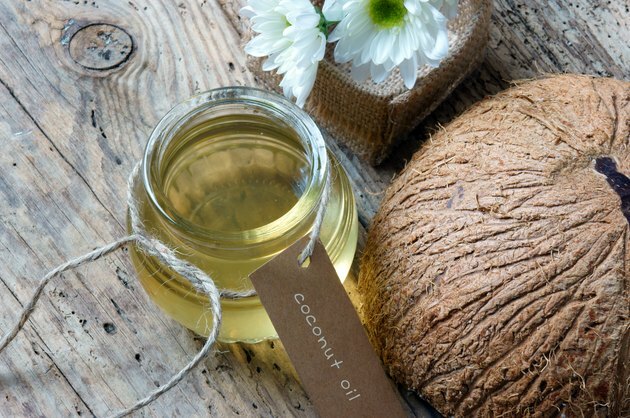 While coconut oil is touted as a health food, the studies are limited. When it comes to a healthier choice, olive oil is still the winner. The fat in coconut oil is 90 percent saturated fat. Fortunately, 72 percent of this fat comes from medium chain fatty acids. Unlike animal fats, these fats don't supply cholesterol. Long-term use of coconut oil actually increases good (HDL) cholesterol. Many people continue to believe that coconut oil damages your body. It can, for example, increase bad (LDL) cholesterol. Thus, doctors suggest limiting your use of coconut oil until scientists collect more data. Read more: Is Coconut Oil the Miracle Food It's Cracked Up to Be? Approximately a quarter of the fat in olive oil is monounsaturated fats, which are recognized by the American Heart Association as being heart-friendly fats. In addition, the Mediterranean diet promotes the consumption of large amounts of olive oil and other monounsaturated fat-rich foods such as nuts, seeds and avocado. Monounsaturated fats can help lower your LDL cholesterol levels. Moreover, extra virgin olive oil is a good source of vitamin E and polyphenolyic compounds — antioxidants that can lower your levels of systemic inflammation. The smoking point of olive oil corresponds to 280 degrees Fahrenheit, which is relatively low and indicates that olive oil shouldn't be heated to high temperatures. One of the benefits of cooking with coconut oil is that its smoking point is 350 degrees Fahrenheit, making it more appropriate for cooking at moderately high temperatures. Cooking above the smoking point of an oil is not recommended and can lead to the formation of compounds that may be harmful to your health. Olive oil is usually liquid at room temperature but becomes solid in the refrigerator, whereas coconut oil is hard when kept in the refrigerator and can be either solid or liquid at room temperatures because of its melting point of 76 degrees Fahrenheit . Read more: What Are The Dangers of Heating Cooking Oil? You can use both olive oil and coconut oil for cooking vegetables or meats at low temperatures. However, it's best to use a less-expensive olive oil for cooking and keep the high-quality extra virgin olive oil for seasoning your meals or preparing homemade salad dressings. Heating extra virgin olive oil will result in the destruction of its precious vitamin E and polyphenolic compounds. Although the taste of olive oil doesn't work well with baked goods, coconut oil does impart a good flavor. You can simply replace the fats in your usual recipes, whether margarine, shortening or vegetable oil, with the same amount of coconut oil, and you'll get similar results. Does Coconut Oil Lose Nutritional Value When Heated? What Are the Dangers of Heating Cooking Oil? Can I Use Coconut Oil to Cook Eggs in a Frying Pan?